[UPDATE]: I've been informed that due to a mix-up, I was playing the Beta build of the game. I will post a re-written piece of the recently patched retail release soon. Please read on, with this in mind. Darkout is an indie survival game from Allgraf. It's a sci-fi game that crashes the on dark, forbidding planet. Forced to fend for yourself, players must construct shelter, learn, research and adapt to the environment. It's atmospheric environments are intriguing, but forbidding. There is a great deal to discover and do in Darkout, but players will have to struggle through the games numerous issues to get there. 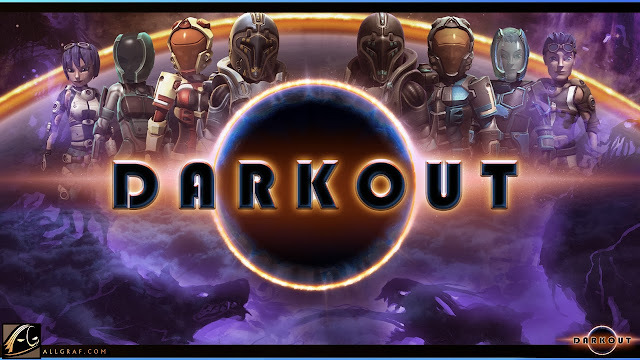 True to it's name, Darkout is, well dark. Very dark. The game has a day and night cycle, but I found it difficult to tell the difference between the two. A lot of the plants give off small amounts of light, but it's often not enough to light the environment at all. I found the environments less fun to explore because I couldn't see a damn thing. Later in the game, as I researched and developed new light sources for my suit, this frustration was eased, but getting there was a real slog. The game gives very limited instruction on it's mechanics. While many find this frustrating, I've always found it fun to figure things out on my own. Minimal instruction, especially in a survival game adds to the sense of discovery. Those "hey, look what I can do" moments kept me playing Darkout, even at it's most frustrating. The crafting system is interesting. Harvesting resources is made particularly easy thanks to a single button harvesting system that automatically selects the proper tool for the resource. Players can spend research points (earned by harvesting resources) to gain new recipes and craft better materials and gear. Building shelter can be very frustrating as the blocks don't always respond as they should. I spent ten minutes trying to put a block down next to another block before I gave up. Ironically, this mirrored my real life experiences with trying to build things pretty well. The game requires players to explore it's areas in order to secure new materials and discover more of the worlds secrets. Here again, I was met with frustration. The randomly generated world the player inhabits doesn't play nice. Twice, the game started me off in an area that I was unable to traverse effectively. Hills too steep to climb, long drops that killed me, ground that I couldn't dig through for some reason, the list goes on. My current game won't allow me to pass in a certain direction at all. Whenever I attempt to move past a particular spot, I die. Unlike some survival titles, death is not the end for you in Darkout. The player respawns beside their bed with half health after they are killed. This takes some of the umph out of the survival aspect of the game as you are basically immortal. However, death is so common an occurrence that being able to respawn without losing any resources is actually rather nice. It took me about four solid hours of play to get the hang of Darkouts research and crafting system. After that, the game became a lot less difficult to manage. The more I have played, the more I've found to like. Unfortunately, there are still those troubling bugs and vagaries in the interface to remind me of my frustrations. I wouldn't say Darkout is a bad game, just an unfinished game. If upcoming patches and updates can address the major issues in the game, Darkout could really distinguish itself as a unique title. The management of power and light, it's streamlined gathering mechanic, and sci-fi aesthetic are wonderfully done and deserve a look. It can only get better with time and attention.